Are you looking for a delicious chocolate recipe with a difference? If you are, you’ve found it! Here’s my sticky banana and chocolate tart for you to enjoy. What a fantastic way to end a meal. So far, I don’t think I’ve met anyone, especially children, who doesn’t like this recipe. I promise you that once you’ve made this dish and realise how easy it is to do, it will become a favourite. My tip would be to make sure that you bake the tart in the middle of a preheated oven to avoid the pastry burning. If you have to, you can replace the bananas for firm large pears, peeled and cut in half. 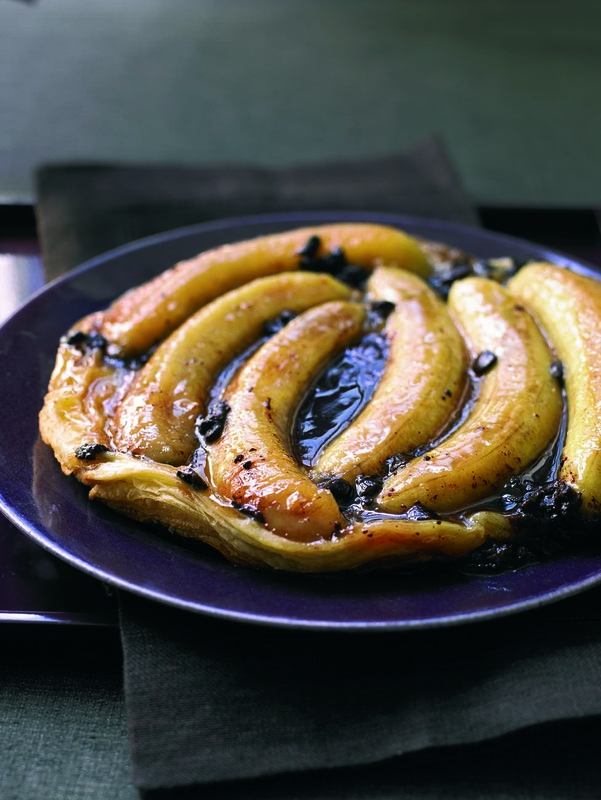 Feast your eyes on the finest sticky banana and chocolate tart! It’s straightforward and fun to make this great dish. Simply follow the instructions below and get the perfect result. Melt the butter with the sugar in a deep-sided, heavy-based frying pan that can be used in the oven. Cook over a medium heat for about 5 minutes until it turns into golden caramel. Remove from the heat and set aside to cool slightly. Preheat the oven to 200°C/400°F/gas mark 6. Place the whole bananas in the pan creating a circle, breaking as necessary, ensuring that the entire base is covered. Sprinkle over the chocolate chips. Meanwhile, unroll the puff pastry onto a floured surface and cut a disc shape about 25cm diameter, or about 5cm bigger than the top of your pan. 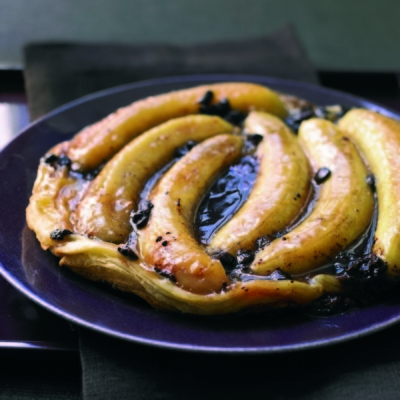 Lay the pastry over the bananas and tuck the overlap down inside the pan with your fingers. Bake the tart for 20–25 minutes or until the pastry is golden brown. Remove from the oven and set aside to cool for about 5 minutes. Take a large circular plate and place face down on top of the pan. Quickly invert the pan to turn the tart upside down. Remove the pan, leaving the bananas facing upwards. Serve generous portions with vanilla ice cream. 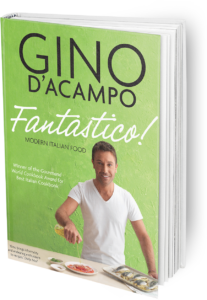 Once you’re done, simply sit back and enjoy your sticky banana and chocolate tart and don’t forget to check out other great authentic Italian recipes including great antipasti recipes, Italian pasta recipes, Italian soup recipes, Italian beef dishes and authentic pizza recipes. Classic pesto is a specialty of Liguria, in northwestern Italy. However, Sicilians have their own equally delicious, lesser-known version – just a few additional ingredients take it in an entirely new and exciting direction. In this recipe I’ve used bucatini pasta, which is basically a thicker version of spaghetti with a hole all the way through, but of course pasta of any shape will be fine. Often people have this misconception that you can only make meat skewers in the summer and cooked on a BBQ – this is not the case. Make sure once the skewers are ready to be cooked that your griddle pan is very very hot to enable the meat not to get stuck to the pan. Use sirloin steak if you prefer and if you don’t like mushrooms substitute it with shallot onions. There’s nothing quite like the taste of a good pasta puttanesca. It’s a real Italian classic and, when I’m back in Naples, my mother cooks this for me at least once a week. She always says that it reminds her of my late father – apparently this was the dish they both ordered on their first date. Well, it must have been pretty good – otherwise I wouldn’t be here, would I?